Nepenthes alata is going to help us learn a new word, today; polymorphic. Can you use it in a sentence? Nepenthes alata is highly polymorphic..? 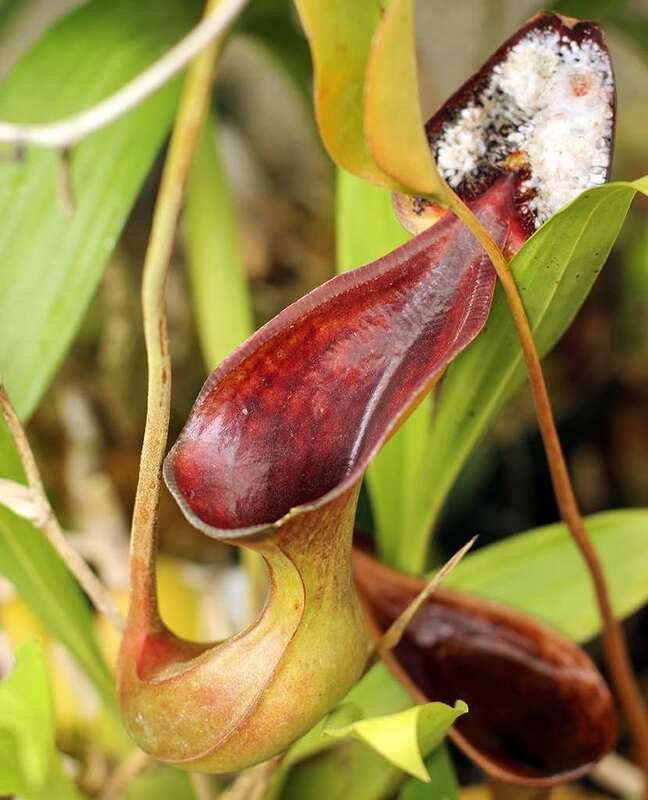 In lamen terms, it just means that this tropical pitcher plant from the Phillipines is highly variable and has plants within the species that display a variety of traits – like pitcher shape, coloration, etc. To solidify this concept, imagine a black jaguar vs. a spotted jaguar. They’re both jaguars, but they’re displaying different phenotypical, or outwardly-physical traits. 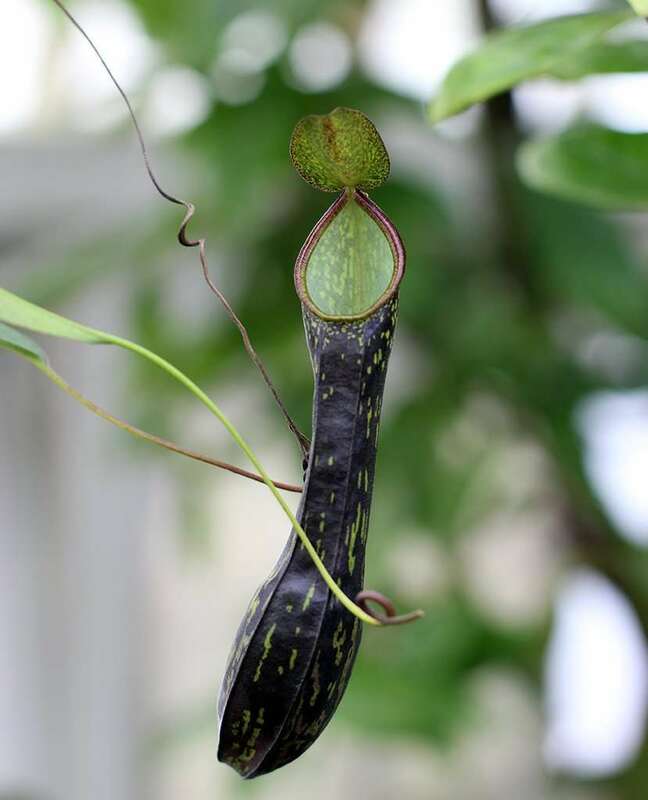 In the case of Nepenthes alata, all of these different forms, or “morphs” of the plant are considered the same species even though they have different physical, or phenotypic expression of their genes, because they all inhabit the same location, and all randomly interbreed with one-another. 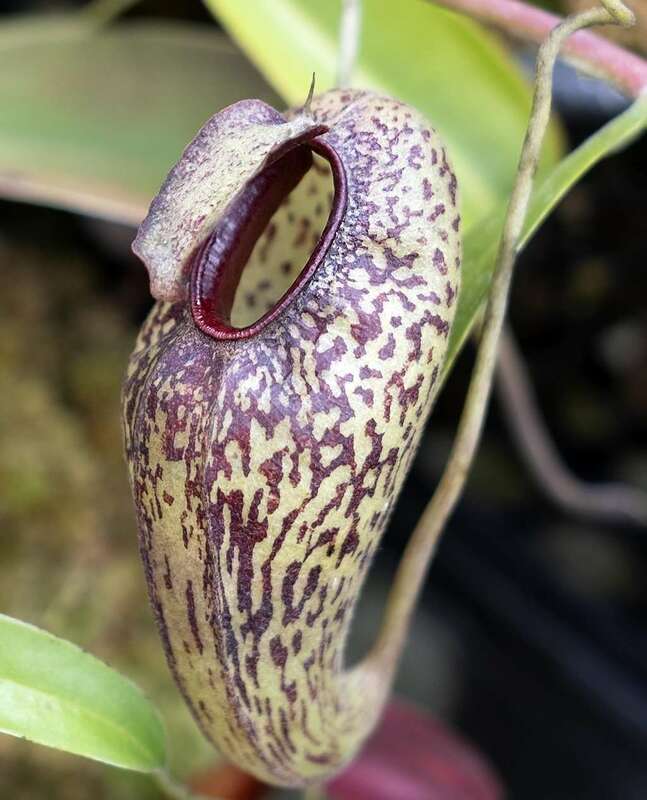 By the way, if you’re looking for a great beginner’s Nepenthes, this is one of the heartiest, most forgiving species you could start with. 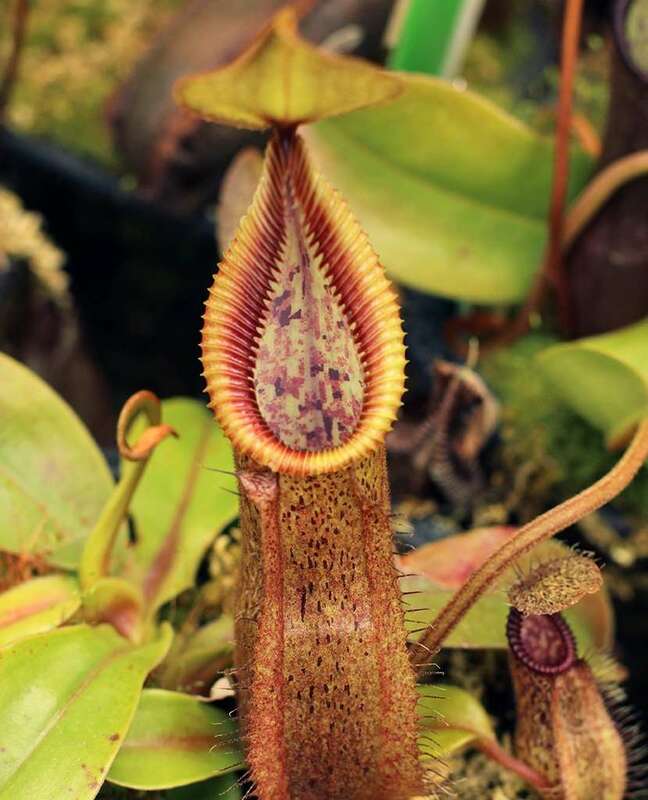 It’s frequently hybridized with N. ventricosa to create the uber robust N. ventrata (get it? ventricosa + alata). “Ala” is Latin for “wing,” and refers to Nepenthes alata’s prominent lower pitcher wings. 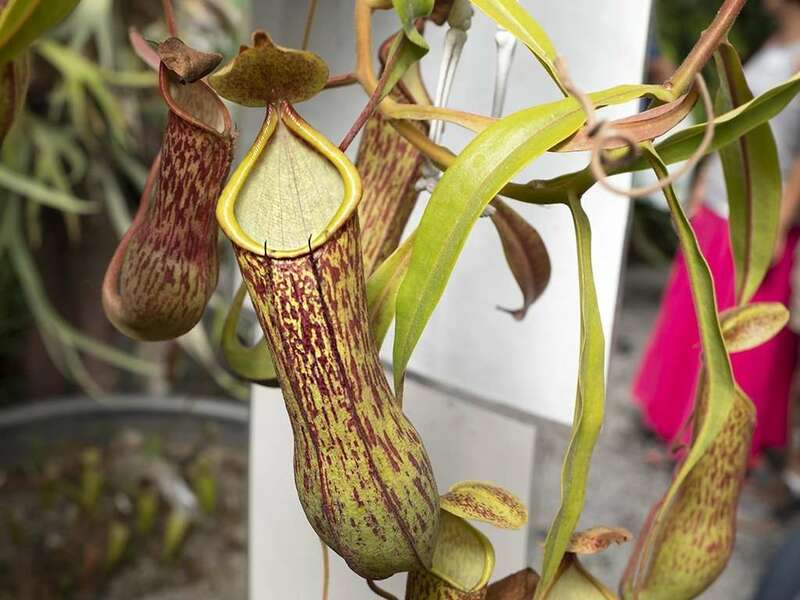 As mentioned, the plant is highly polymorphic, with pitcher’s ranging from yellow-green, to red, to speckled, orange, purple, and a variety of configurations in-between. Pitcher shape tends to be slender expanding into a bulbous lower third, closest to the tendril. Peristomes are simple and narrow and give way to a tear-drop shaped mouth. 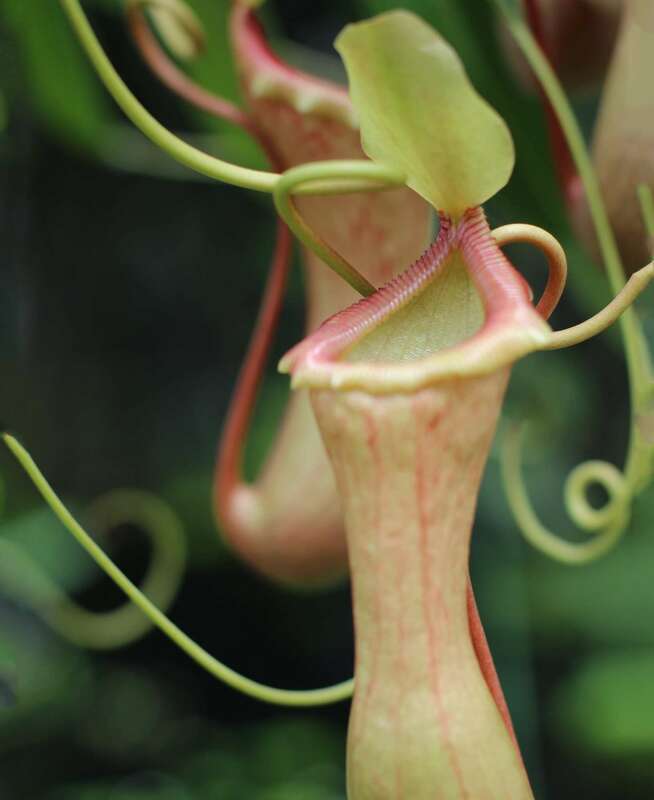 Lower pitchers are around 7 in (18 cm) tall, and uppers tap out around 9 in (23 cm). 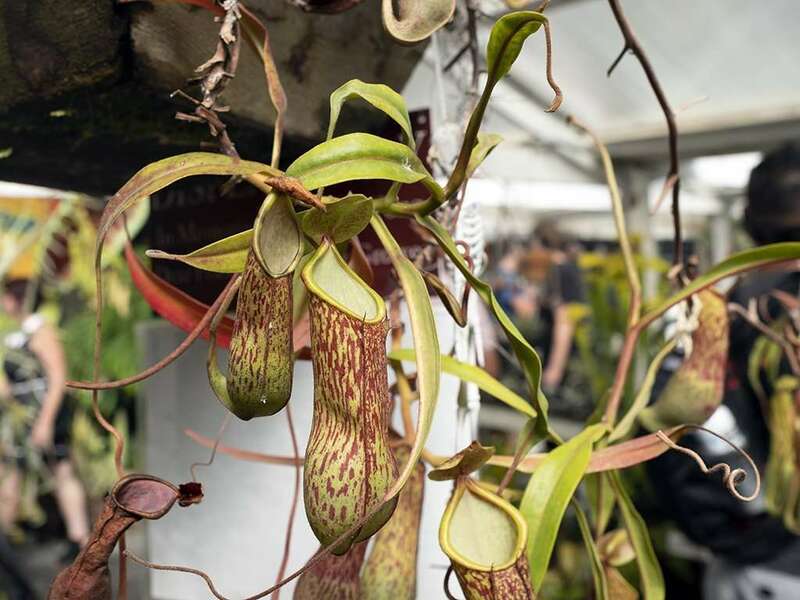 Nepenthes alata supports abundant simultaneous pitcher development – it grows so quickly, you can have a dozen healthy pitchers on one plant at a time. Nepenthes alata naturally grows from sea level up to about 6,200 ft (1,900 m), but it’s sweet spot is below 4,600 ft (1,400 m). Technically, this makes it mostly a lowland plant, but it’s also tolerant of highland conditions, so it’s a bit of an intermediary grower. N. alata isn’t too picky about growing conditions, and will grow both terrestrially, and as an epiphyte (growing in trees). 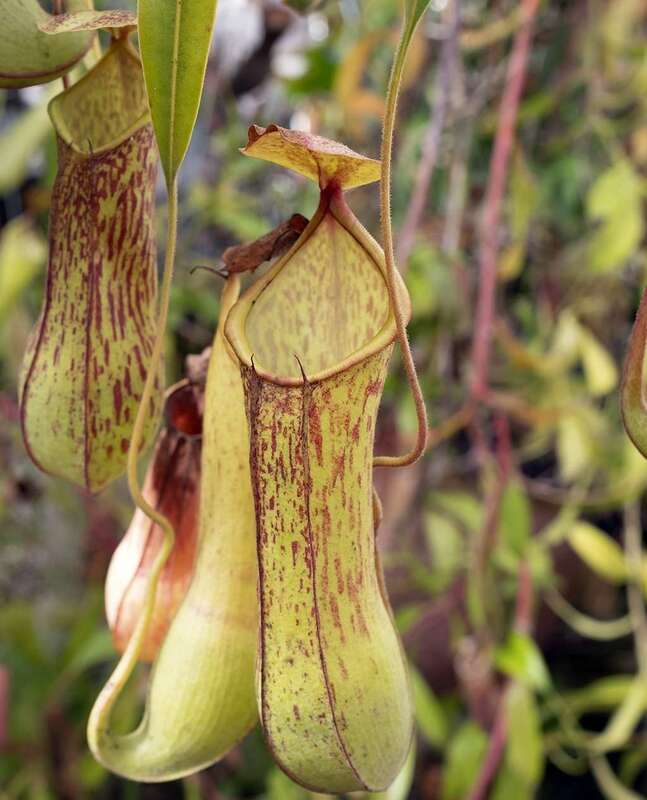 This tropical pitcher plant is a scrambler, growing as an ever-taller mass of leaves and pitchers attached to a narrow stem. Because of this, it’s often found tangled in and supported by bushes and tree branches. 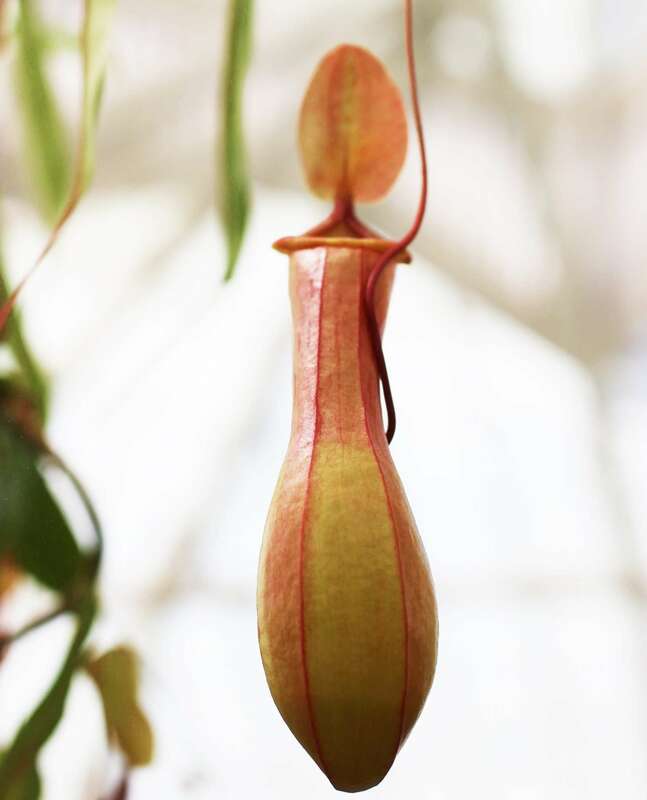 With unique domed pitcher shape and outwardly-facing mouth, Nepenthes aristolochioides is instantly recognizable, and with pitfall, lobster, and flypaper traps, the tropical pitcher plant is a jack of all traps. So beautiful, so deadly. 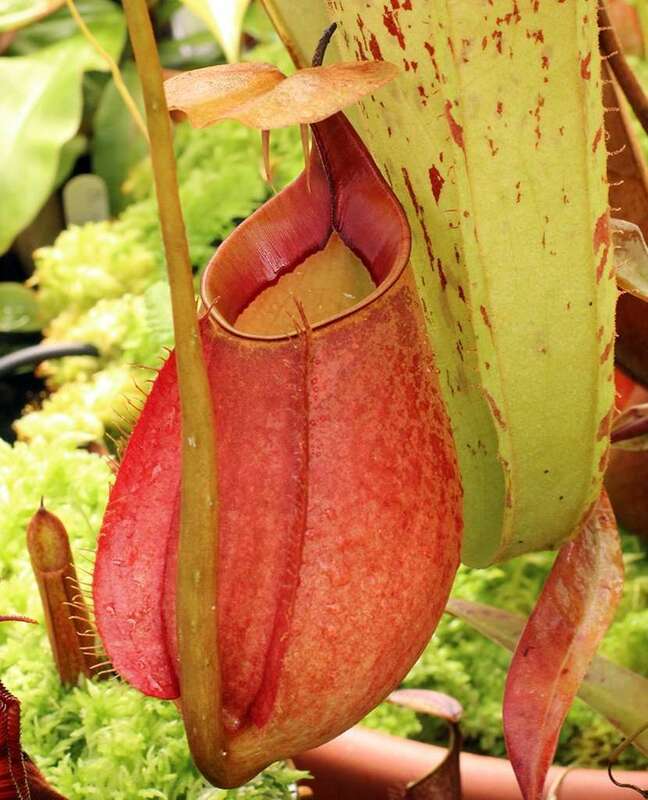 Nepenthes alata is a highly variable, widely grown, and hugely rewarding tropical pitcher plant. 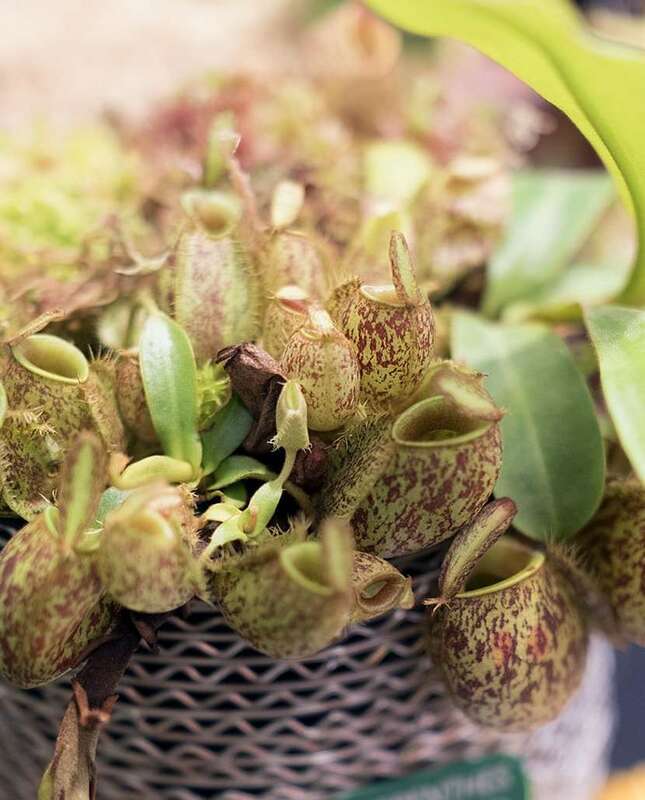 It's great for beginners looking to cut their teeth on an easy-to-grow and pitcher-prolific species. 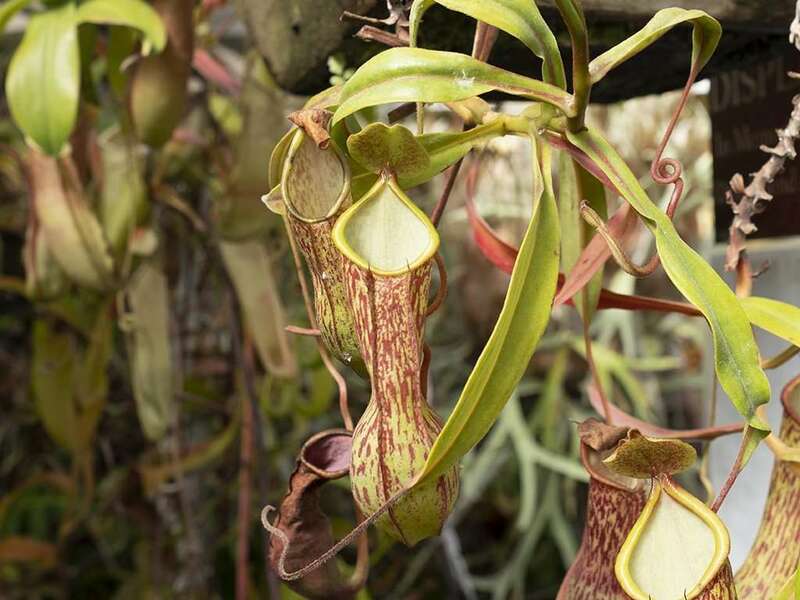 A heavy-hitting lowland Nepenthes species with broad variability and even broader size. It was treasured by Victorian-era botanists for its beauty and it's easy to see why, even today. To say Nepenthes ampullaria is unique, among a sea of unique Nepenthes, would be an understatement. The plant leans heavily on a vegetarian diet, playing host to critters that help it digest debris that falls from the forest canopy above. 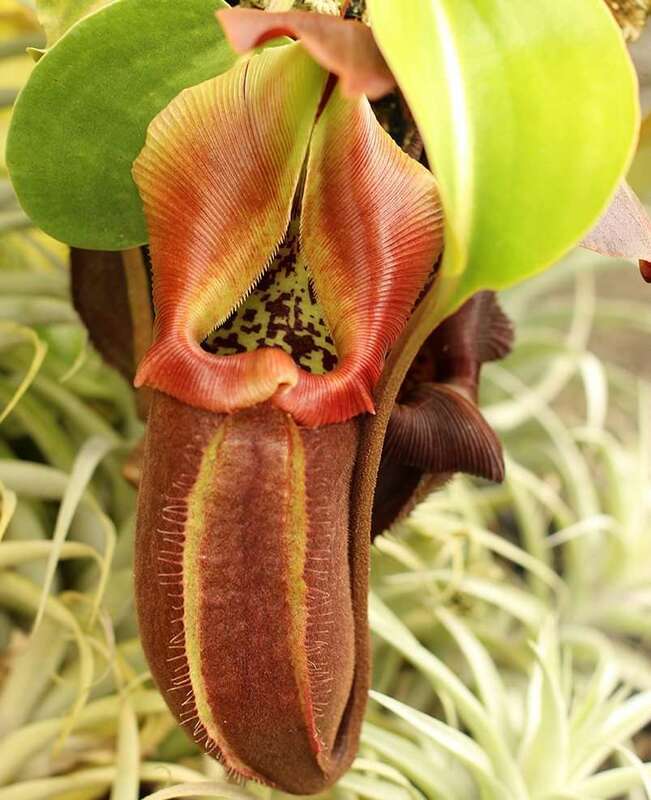 Nepenthes albomarginata looks like it’s going on a date, all dressed up with a classy white collar. The characteristic band of white under the peristome serves a unique purpose, though - and it’s not for attracting the ladies or gents - rather, a specific type of prey. 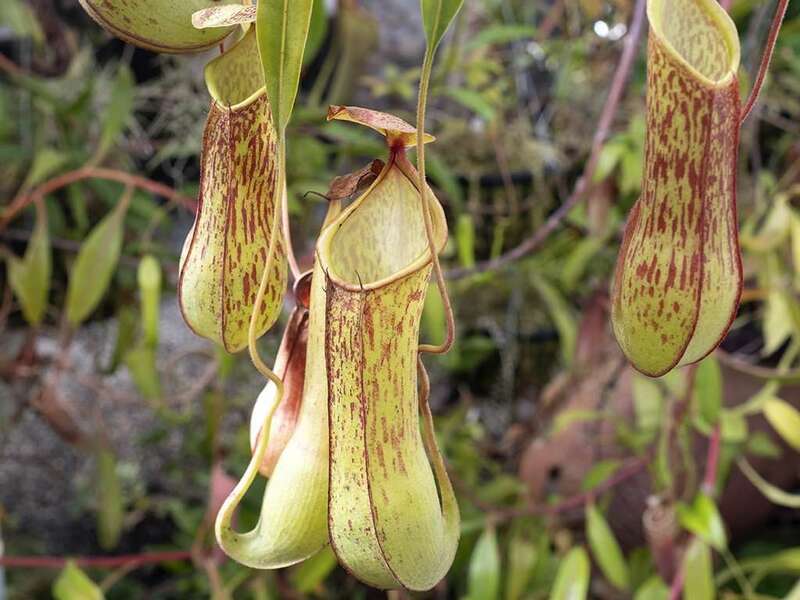 Known as the "splendid pitcher plant" for good reason. It combines the most beastly characteristics of a flanged, spikey peristome with the handsome refinement of a cylindrical pitcher shape. It's like a lion in a tuxedo - it will bite your face off, but will do it with style. This gorgeous hybrid Nepenthes is what happens when you take two beauties, N. robcantleyi and N. hamata, and make a celebrity baby. 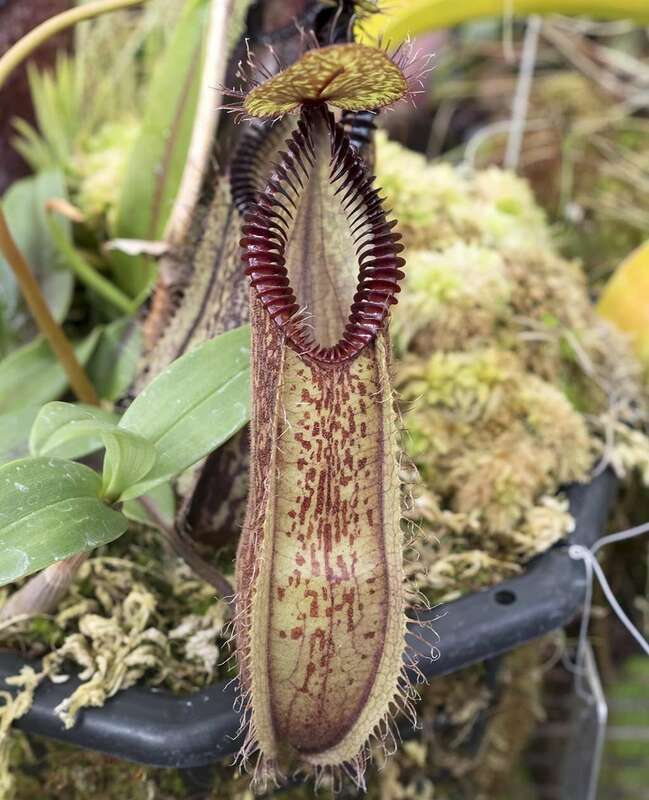 This tropical pitcher plant has black pitchers and a branched spur on the backside of where the lid and peristome meet. - Kind of like cowboy spurs, but less pokey. 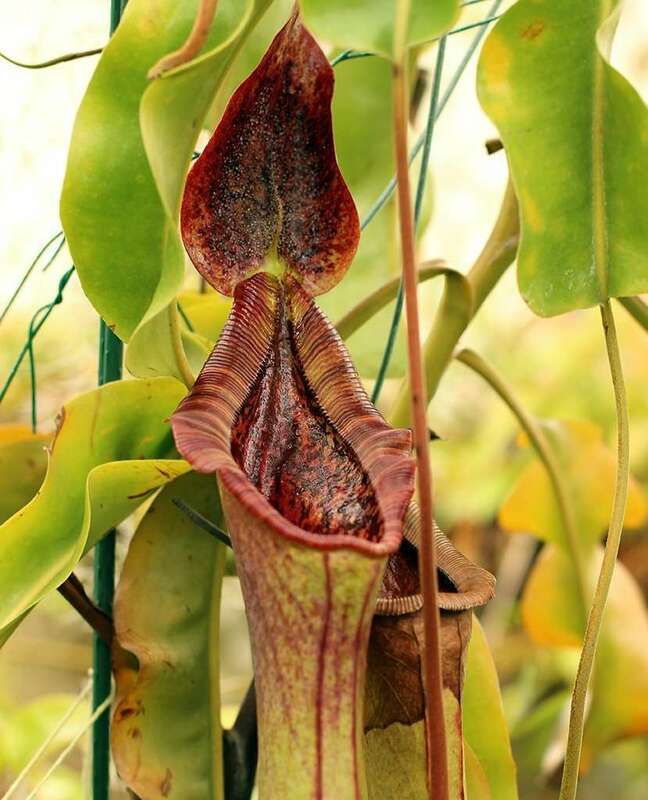 This robust Nepenthes hybrid adopts the huge peristome of N. truncata pitchers and gaping mouth and lid of N. lowii. 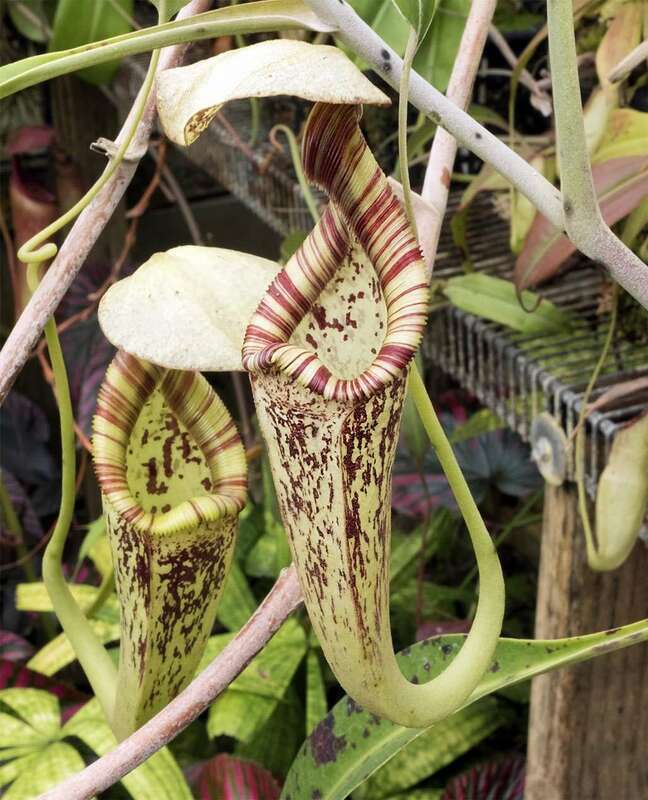 It's truly one beast of a tropical pitcher plant! 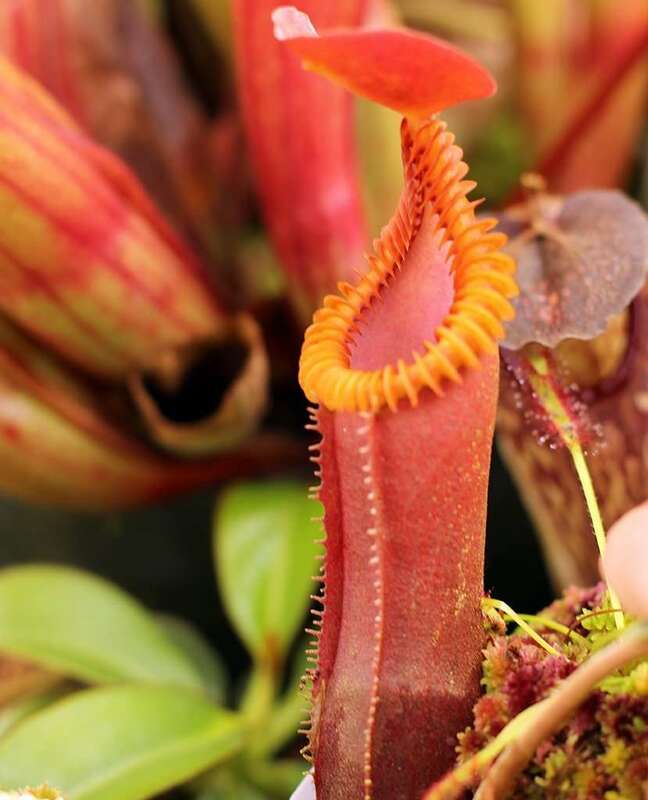 With knife-sharp hooks for a peristome, Nepenthes hamata is insect nightmare fuel and, hands-down, the most vicious looking tropical pitcher plant. If I were an insect, I'd refer to this as a Nope-enthes. 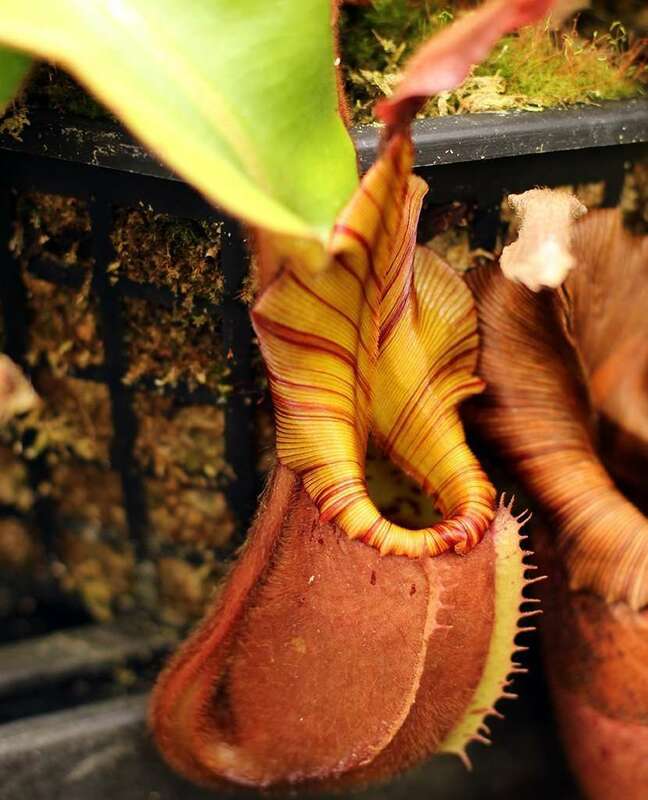 Ever imagine what would happen if a vampire bit a Nepenthes? Really? Me too! Well, wonder no more. 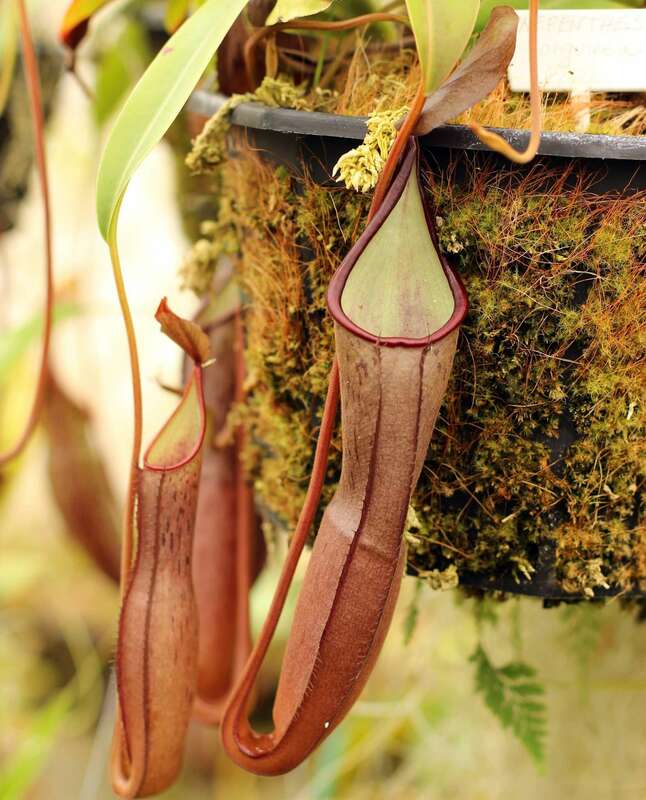 Nepenthes bicalcarata is our fanged tropical pitcher plant. The ol' toilet bowl for tree shrews. 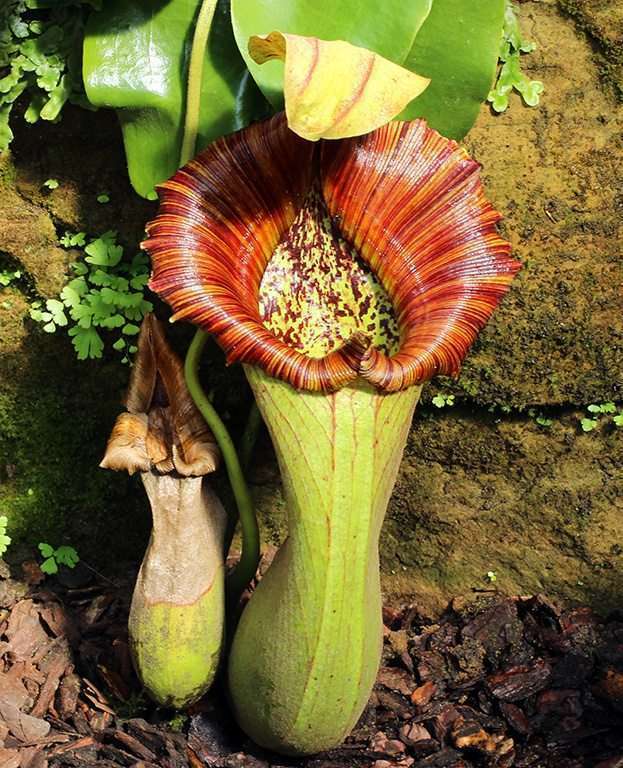 This tropical pitcher plant is famous for its odd upper pitchers that are not only shaped like toilets, but also act as actual toilets to climbing critters lucky enough to stumble across their secrets. 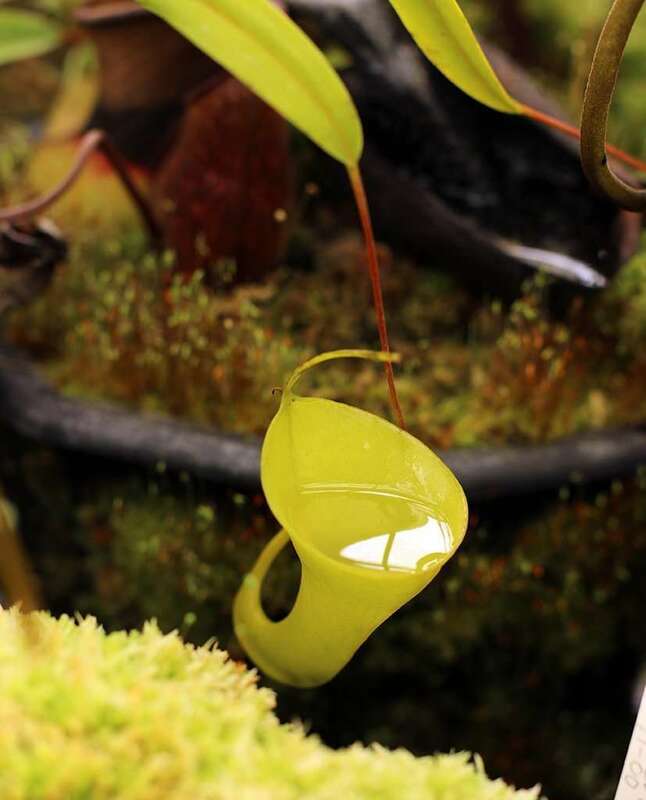 With upper pitchers like dainty cocktail glasses filled with honey, Nepenthes inermis is a fascinating carnivorous plant that uses both flypaper and pitfall trapping mechanisms. 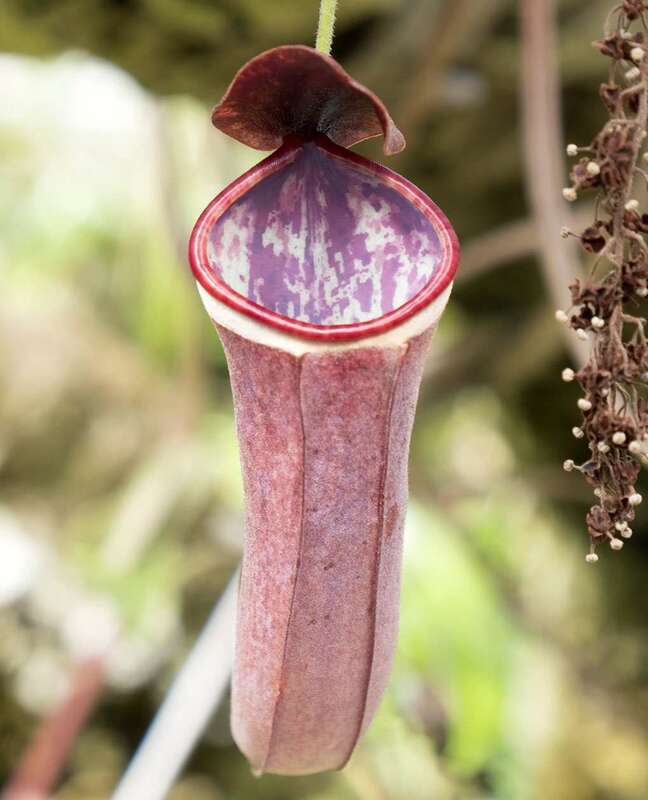 Translation of sanguinea is "blood red" - suiting name for a Nepenthes with pitchers so red that they almost appear purple. 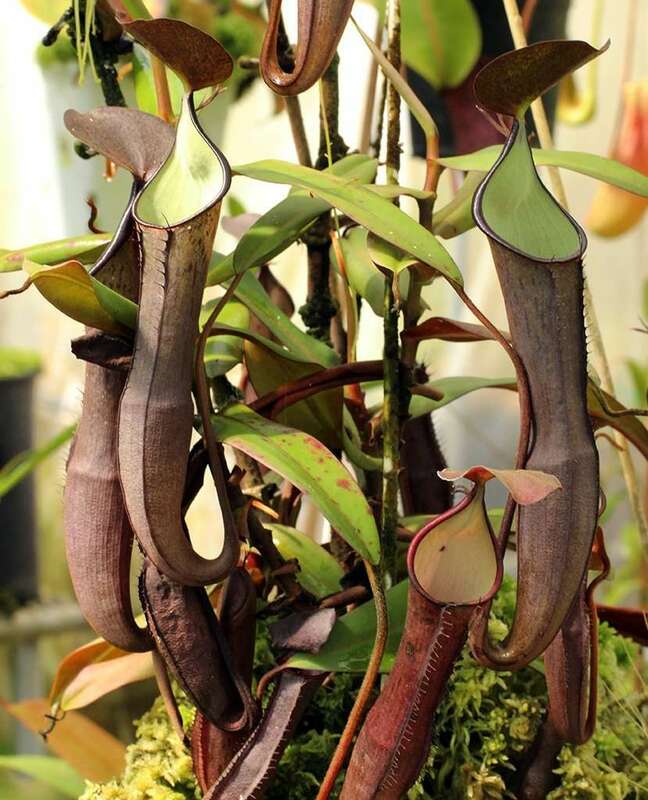 The name is a combination of "ventricosa" and "alata," like "Brangelina" but with Nepenthes. Because it's easy to grow, popular in cultivation, and has a celebrity name, it's a star in my book. is an extravagant, fuzzy tropical pitcher plant that hugs and climbs tree trunks as an epiphyte.